Who is right for halftime bets? You spent the last two hours handicapping a football game that is now approaching kick-off. 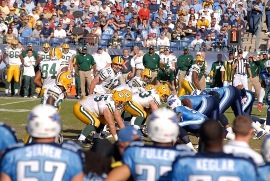 Your efforts tell you that the Green Bay Packers should win the contest by at least three points. At the time you started picking apart this Monday night game, stat by stat and injury by injury, your sportsbooks were offering a tasty -3 +105, BUT the line moved against you while you were checking your almanac. Your bookmaker is now asking you to give up -3.5 points at -110 for a play on the cheese heads. If you don’t have access to a bookie who is still hanging the -3, you are either forced to pass on the event or go for it, risking more than you know you should. Many of us are action junkies and would lay the extra half point, although betting in this manner will eventually eat away at our bank roll. Handicapping an event and forming an opinion is only part of the battle. Every profitable gambler and bookmaker knows that line shopping, and more specifically, line movement is the key to a player’s success. Following the path of changing odds offers an enormous advantage over the long haul. A NFL bettor may follow football lines all week in order to gauge the right time to strike as betting lines gradually move in and out of his favor. We have all pushed on a play where we would have won had we put more effort into getting that half point. For most gamblers, sitting in front of online betting screens all day is not a realistic option; although many of us will not hit the magic winning percentage of 53% without at least tracking the quick moving odds right before the game. If you are on the verge of understanding the importance of paying less and obtaining the better line, but do not plan on wagering for a living, the half time bet may be a valuable option for you. Halftime odds offer you the ability to get a fresh line and follow it until it comes off the board. Without going into another article about line movement, watching a normal line through its lifespan is something that can take anywhere from half of the day to a week. A 2nd half bettor watching multiple books is able to get a great feel on which way the line is headed and pounce on the offering that suits his play. He may use the same techniques in a span of only 5 minutes. In the course of setting full game odds, bookmakers will frequently peek at what one another are offering. Many will base their odds on what their neighbor is doing and go from there. During halftime there is little opportunity for them to consult with others. Out of five sportsbooks at least one book’s opinion will likely drastically differ from the rest. This line will adjust quickly as people bet into it, but this initial soft line offers the occasional shot at an extra two points you may not see offered again during the intermission. Hypothetically, let us say you wanted to play the over on a NBA total that was set at 190. You were able to follow the line movement and earn a valuable 3 points towards your bet. From time to time, these big line moves do happen, and they also happen to 2nd half odds. Even though you are wagering on half of the event, that doesn’t necessarily mean you will get half of the line movement. Getting 3 points from that 190 is a great find, but getting 3 points on the 2nd half over/under total of 95 provides an even better advantage. It is a larger percentage of the line you are trying to beat. Think of this advantage as a head start in a race. A 20-foot head start would be much more effective in a sprint than in a marathon. I have heard gamblers say that they do not like this quick betting style because it does not offer adequate time to crunch numbers and trends. My response is that bookies have already utilized much of the information you are weighing into your normal capping. At a game’s intermission, the player may gain the knowledge edge. Linesmen are often forced to offer odds on many mid-game events at the same time. It would be impossible for them to follow every individual game as closely as the one you are watching, and a week’s worth of inside information no longer comes into play. This line is largely based on what happened in the first 24 minutes. The fast pace of halftime wagering is not for everyone. If you don’t enjoy getting numbers dumped on you all at once in order to get more for your buck then you may want to spend the 2nd half on the bench. If you want the ability to follow the life of a line, take advantage of more unique or soft numbers, apply your effort to a smaller contest and know as much as or more than your bookmaker, then the 2nd half may be your best bet! By: Bill Dozer, SBR Analyst.© 2004 All rights reserved. Bill Dozer: SBR Writer, Analyst, and Sportsbook player. Mr. Dozer warns other players of scams and provides advice in dealing with offshore sportsbooks. For more information visit Sportsbook Review.